Speedy Cheezy Protein Pasta Bowl! Comfort Bite. One afternoon I whipped up this Speedy Cheezy Protein Pasta Bowl (for myself, not to blog) but I was so hypnotized by the amazing comfort-food flavor and impressive nutrition profile that I decided I simply had to post the recipe. I don't always take the time to calculate nutrition facts, but I was curious about how much protein was in this recipe.. Per 370 calorie serving, this dish has 24g of veg protein, 13g fiber and under 10g of healthy fats. 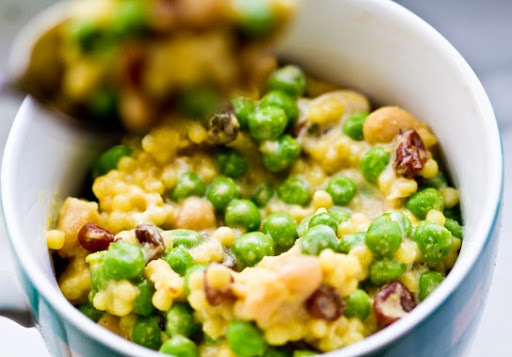 Get my recipe and see why this speedy dish is so protein-packed!.. Mid-Bite, I Grab My Camera.. It's always funny when I make a recipe for "myself" not intending on posting it - then suddenly "mid-bite" I decide I have to post it! I am usually a few bites into the dish and the feeling hits me, "shoot, I need to snap some pics for a post." I'll put down my fork and go grab my camera and do a quickie photo shoot before I can get back to my meal. Ah, the sacrifices of delayed meals, all in the name of food blogging. This recipe was originally a twist on my Easy Cheezy Peasy Pasta Balls recipe. 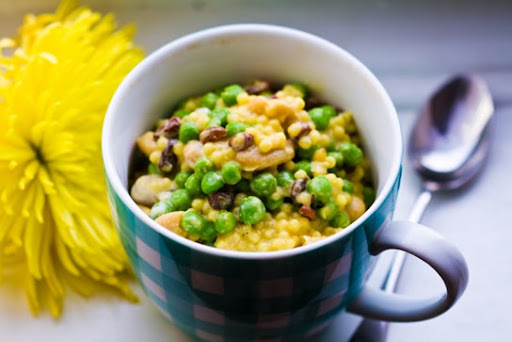 But it evolved quite a bit and I really love the creative savory sweet flavor between the peas, beans, raisins, toasted couscous and nutritional yeast. This recipe would be fabulous for kids. Speaking of kids... Check out my guest post over at Savoring the Thyme! I share my list of favorite kid-friendly vegan recipes. Protein Bowl: beans and peas! This recipe is packed with vegetable protein. 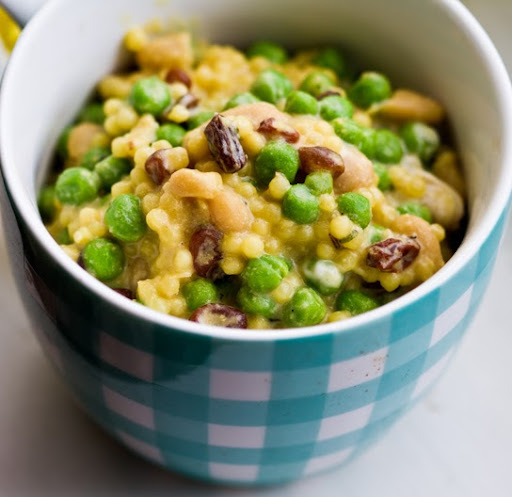 It includes white cannellini beans, organic frozen peas and nutritional yeast. You'll notice there is no "cheese" in this recipe - but the generous amount of nutritional yeast makes a savory "cheezy" sauce accented by garlic and herbs. Nutrition Facts. 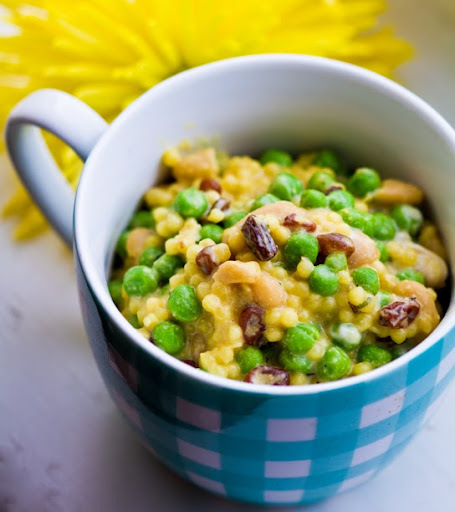 This recipe is great for a dinner side dish, main entree or make it ahead for your lunchbox. This recipe makes about 5 servings. In each serving you'll find a nice dose of high quality vegetarian protein and fiber - and a hefty dose of complex (good) carbs. 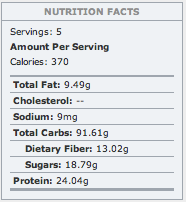 *nutrition facts calculated via MacGourmet Deluxe. There is a very generous amount of nutritional yeast in the recipe - so much flavor! The rustic beans, peas and pasta pair perfectly with the nutty, savory nutritional yeast cheezy garlic-y sauce. More on nutritional yeast. On raisins.. I'm not a huge raisin fan, but they add such a lovely soft sweetness to this dish. So give them a try even if you are a raisin-phobe. Modifications: If you want to switch out the Israeli couscous for a different variety of pasta or rice - go for it! 2-3 Tbsp Vegenaise (optional) - note, the addition of Vegenaise is not factored into the nutrition label above. It add a nice creamy texture to the pasta. 1. Toast the dry couscous in 1 Tbsp of olive oil in your soup pot over medium heat - stir and toast for about 1 minute. 2. Add in the couscous water and a pinch of salt. Bring to a boil, cover with lid, reduce heat and let simmer for about 8-10 minutes. When the time is up, turn off the heat, but do not remove the lid. Let the pasta sit for another 5 minutes. 3. Lift the lid and fold in the remaining 2 tbsp of olive oil, vinegar, nutritional yeast, garlic powder, raisins, Vegenaise, pepper and canned white beans. The warm pasta will warm the ingredients and create a soft sauce. Fold in fresh basil or herbs (optional). 4. The last step is to gently steam your frozen peas and then fold them into the mixture as well. You can also fold the frozen peas directly into the hot pasta and allow it to heat gently. 5. Serve your pasta warm and with a big spoon! dive in..